Fricking Lerverkusen...ruined my unbeaten streak and put qualification from the CL groups in the balance as I lost home & away to the dirty Germans! One loss? Omg how do you do it? I don't get that. Your defensive setup must be very good. I keep conceding goals. What formation are you playing ATB? Guys, don't mean to alarm you, but I've just signed Paul frigging Pogba! You mean matchpreparation or just looking yourself for the right setup? Anyone gone further a couple season how is wilshire? does he progress at all? Hello all, wow, what a frustrating season for me! Wish I was doing as well as a lot of you lot. My transfers, Diarra (very solid) was the only first teamer out of that lot really. This was the only decent thing I did all season really (IMO) which was scraping (to say the least) my way to the Champions League Final against Barcelona. Feel like jacking it in & starting again but also want to try and sort things out. These were the tactics I mainly used, would flicker between the two depending on the game being home or away etc. not always with these players either. 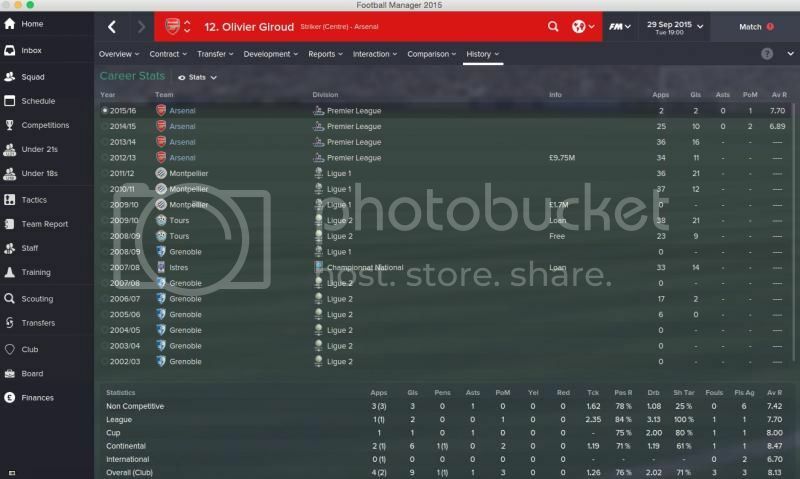 As an avid Arsenal fan, naturally I had to begin FM15 with the Gunners. I am quite a slow player, so my soundbytes will likely come in half-season instalments! 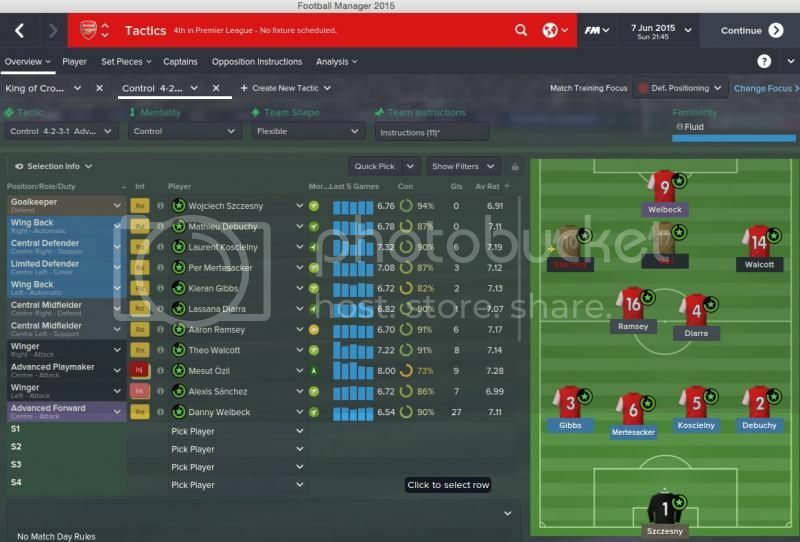 I prefer to play as realistically as possible and like to establish the 'Wenger way'. 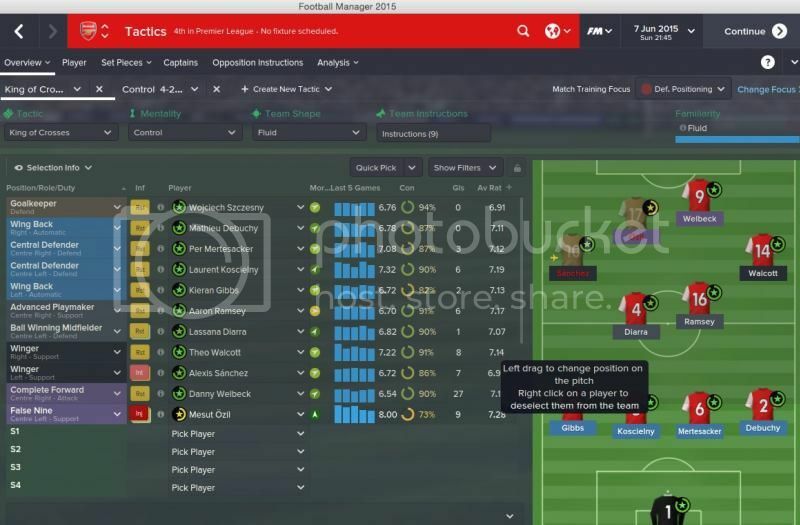 With Arsenal now a financial superpower on FM, I wanted to add a few casual rules to my file. Focus on Youth - develop young talents where possible, especially English ones in accordance with the home-grown rules. Streamlined Squad - we are Arsenal not Chelsea! Keep the squad streamlined with 'as needed' main purchases, no huge overstocking of players or high wage players sitting unwanted or unplayed on mammoth wages just because we can. To that effect, also limited procurement of free players. The Unknown - take an occasional punt on an unknown quantity, the new Toure or the new Stepanovs? There are two huge problems with the Arsenal squad; the lack of defenders and the absence of power in midfield. 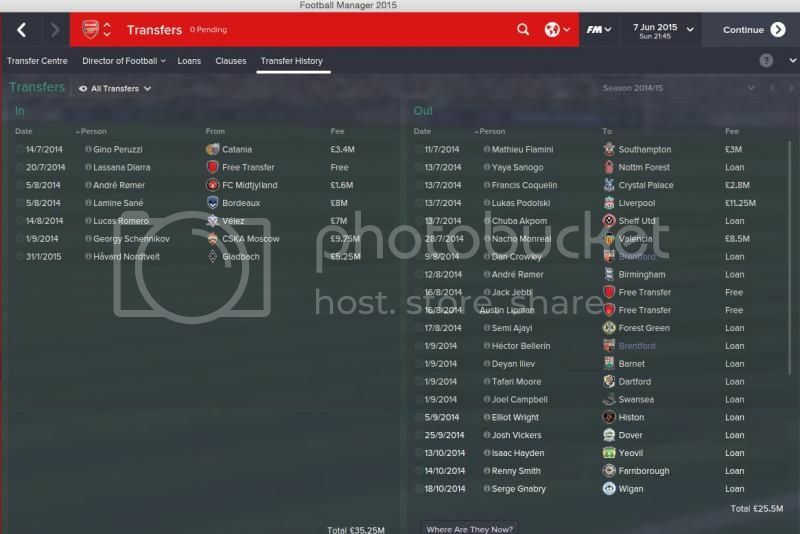 With a £46.5m budget, my initial plan was to remedy the situation. To that effect I signed Benedikt Howedes and Lars Bender. Cliched signings perhaps, but ideal for my needs. Bender was the only DM I targeted due to his sitting/destroying/box-to-box capabilities. I actually preferred Chiriches for defence, signing him on my initial Beta. This time Man Utd swiped Vertonghen and the Romanian proved unavailable. Howedes was the next in line. Berahino was my third main purchase, nabbed on an £8.5m deal with a loanback. He fits the criteria of adding to the home-grown list and is essentially a Walcott in miniature. The squad already has an abundance of midget, rapid, half-forwards, but I see Berahino proving a valuable addition over time. Talented Karlo Lulic added to my future prospects, loaned back to Osijek in the interim and I took a punt on Gabriel Almeida, a virtual unknown with reasonable potential and whom had Portuguese heritage. 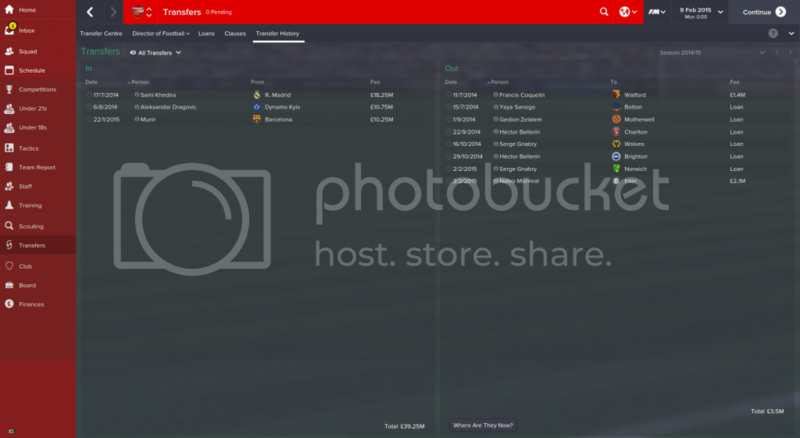 Coquelin was my only sale, an unneeded jack of all trades, but that role is covered by Flamini. Sanogo went out on loan to newly-acquired feeder club Nottingham Forest to see what he could do, Gnabry moved on loan to Norwich once fit. Our early season and current form have been polar opposites. As the schedule demonstrates we could not defend for toffee in the early weeks, conceding a plethora of goals. Partly due to lack of cohesion and tactical familiarity, undoubtedly others caused by unsuitable tactics and formation. Two significant problems appeared since the hotfix; goal concessions from corners and - the bane of my FM14 career - opposing wingers ghosting through my defence. After conceding almost every game from a corner, a work-around was found with one or two players zonal marking. These tend to sit on the near-post and stopped the AI from sneaking in at will. In fact, only one further goal has been conceded from a corner since the opening weeks. Wingers decimating fullbacks was a real issue; I have tried all sorts of combinations from the early days of FM14 and found no solution. Wingers ghost behind fullbacks, my own wide AMs simply refuse to track their opposing fullback in countering situations. Or so it seemed....quite a novel solution has been to get my wingers to rabidly close down and man mark their fullback. Widemen are seemingly defaulted to man-mark opposing wingers on the instructions marker, but pushing them high up on the marauding fullbacks has nullified them almost every game, in turn cutting supply and interaction to their own AI widemen. We conceded 23 in the opening twelve games, nine in the following fifteen. A huge difference. It does pull my own widemen out of position though, and has had a detrimental effect on goal-return averages. The home deep-lying 4422 has worked wonderfully well, combined with a high defence and pressing game. It picks up clean sheets for fun. However, in the early stages of the season, I was using a counter-attacking 41221, with a DM, two CMs and two wingers. It tanked, losing the opening three Prem away games, a high-scoring Champions League encounter against Dnipro, a loss to Stoke in the Carling Cup, and it was en route to a 2-0 defeat at Stamford Bridge until I switched up to my home 442 and stormed back to equalise with the last kick. That heralded a use of the 442 away from home too and we haven't looked back since. Stylistically it is similar to the home set-up, except with the use of control rather than attack, harder tackling, and switching the ball-winning CM to a deep-lying playmaker. Essentially, Ramsey and Bender switch roles home/away. At the (almost!) half-way stage we sit top in a cracking 7-way title battle. Chelsea were undefeated until game 16, Man Utd are inconsistent but explosive, and City still somehow lurk despite sacking Pellegrini following a poor start. Liverpool have been top for most of the season. Overall, the most perplexing problem with the Arsenal squad is the amount of flexibility. There are too many players able to play multiple roles. Ozil has been a quandary, as for most. It is clear that wing-play is a solid route on this game, but two-up worked well enough that I don't tend to use an AM. So Ozil has been shunted out on the left wing (he actually has superb winger atts, but it still feels odd...) whilst retraining to play as the deep-lying striker. Giroud has featured as a target-man and advanced forward, but has actually revelled as the deep-lying forward in Alexis Sanchez's absence (out for 3 months with a torn hamstring and has been injured three times in the month since his return, sigh). So much so that the Frenchman is now almost a must-have, 13 goals in 19 games and his physicality and aerial prowess are a real handful. Ozil and Giroud are both settled, but the other two attacking roles have been variously attributed to Welbeck, Walcott, Oxlade-Chamberlain, Cazorla, Podolski and Campbell - mostly dependant on fitness as every single one has been injured at some stage. Walcott is showing signs of form at RAM after injury, Ozil has nicked Podolski's LAM spot, whilst both Campbell and - to a lesser extent - Cazorla have been sidelined yet provided good returns. Welbeck is exactly like his real self; one week blazes a treble, the next missing an open goal from six yards. The definition of inconsistent. As I say, too many options, and I think I could easily move on three attackers, replace with one and be better off for it. The remainder of the team is more settled. Szczesny the clear no.1, Debuchy at rightback, then any of the main three centrebacks fitness dependent (Howedes has been the most impressive). I have a Kolarov/Clichy situation developing at leftback; preferring Gibbs' attacking thrusts at home, but the more stable Monreal on the road. In midfield it is all about Lars Bender; he plays regardless, with one of Ramsey or Wilshere. Diaby is an intriguing wildcard. Doesn't have mojo to really impact as a ball-winner, but can win possession and playmake reasonably, whilst possessing a rocket shot and being a great late-game option to drop the deep-lying attacker for an AM and use him to shore up defensively or act as a shadow striker. Neither Arteta nor Flamini have featured much, and Rosicky is Rosicky - injured. ...to give the U18s a much-needed boost. I've also acquired Patrick Banggaard, a tall 20 y/o Danish CD to provide more depth for the 1st team, the '8th defender'. Finally, fulfilling the 'unknown punt' I've also snapped up Irven Avila, a 24 y/o Peruvian striker with intriguing atts on a free transfer. Unable to acquire a work permit, he'll be loaned out to prove his mettle. Gaining more tactical flexibility is the main aim prior to the start of 15-16. That 442 can't hold out forever. I have a multi-purpose 4231 Enganche sitting as a second formation, but would also like a dedicated 3rd. Toying with the idea of trying a 442 diamond, although dislike the idea of having no wide midfielders/wingers, unless raiding fullbacks and/or lateral movement from the two STs can provide it. Mainly like the idea of being able to easily slot Wilshere and Ramsey in as a tandem ahead of Bender and still be able to use Ozil as an attacking midfielder/shadow striker, and also not entirely kill off any of the other main forward options. Or perhaps even an asymmetrical? Bender sitting, Wilshere tucked inside left CM, Ramsey retrained as a right wide midfielder, an inside forward on the left and some sort of advanced creator right-central. Hello mate, am very interested to see how you got on for the rest of your first season. I played a similar 4-4-2 for the most part and ended up playing a bit like Keegan's old Newcastle, exciting for a neutral but not good for my ticker! I might use your tactics for my 2nd season. Just been offered the Arsenal Job 2016. Can anybody tell em if Scsezny is worth keeping as the main keeper or should I get somone else in? Won the league, fa cup, league cup and champions league in the first season. Probably best squad I've had on football manager. Also have the Champions League against Man Utd coming up in 12 days! Could be a fiesty game. If only this would happen in real life. A quick update. 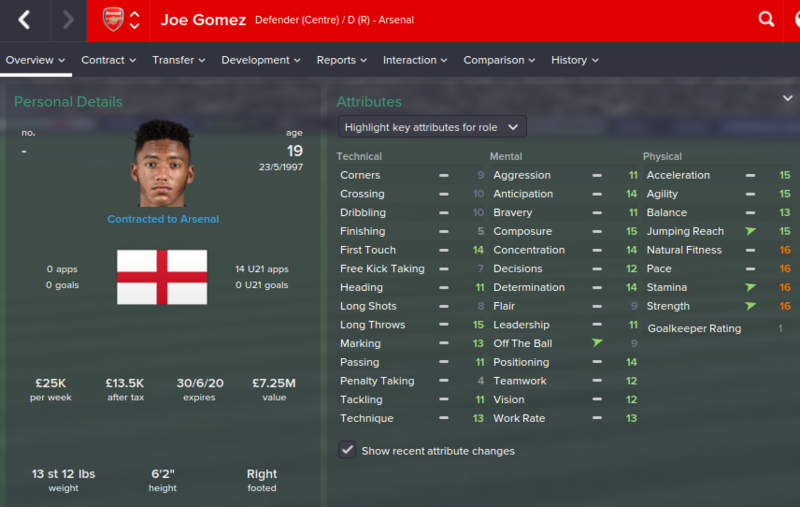 Good news and bad news - I've made my first signing of this save: Joe Gomez will join Arsenal from Charlton Athletic in January on a contract which will run until 2017, worth £416,000-a-year. The fee is around £4 million - to be paid largely in instalments - with the potential of rising to around £6 million if he is to succeed here. He's already made 15 appearances for Charlton this season and has impressed various Arsenal scouts, most recently Steve Rowley. At just 17-years-old, I am hoping Gomez will develop into a fine cnetre-back and an excellent partner to compatriot, Calum Chambers. I've yet to decide whether Gomez will be involved immediately with the first-team upon his arrival. Needless to say, this is the bad news. It's a situation Abou Diaby has been in all to often, sadly, for player, club and country. After recovering well form his previous injury and making a brief substitute appearance in a 4-1 win away to Sunderland, Diaby has once again fallen foul of bad luck. This is likely to be the end of his Arsenal playing career with his contract expiring in the Summer. Should he retire and decide to continue in football, I would be more than willing to employ him. I signed him also, with the loan back clause for the entire season. I then sent him out to Aston Villa where he played pretty much all the league games for them in the second season, he has come along nicely. Developing his physicals well, but I want to work on his technicals a bit more, while being tutored now he's finally here to stay. How much does he cost? The only problem is, he had 12 months left on his contract and someone was sniffing around him. So had to offer him £25k a week bugger. Also that reminds me, after winning the CL and Prem in the second season... Jones, Wilshere and (someone else, name escapes me) wanted a new contract. I thought, you know what, fair enough you're all doing fantastic. Every. Single. One. Of. Them. Wanted bloody £170k a week, which is almost £100k a week on top of their previous deals Managed to get then below the £120k mark in the end! EDIT: Ricardo Rodriguez (who had only been here a year) was the other person wanting a new contract, told him to clear off straight away. Bargain he was at £5.5m though! Cheers Will, I'll be sure to update once I (finally!) get the season done. Lost my unbeaten home record to two Falcao goals. The first, well....long ball clears the defence and Falcao is about 5 yards offside. Szczesny comes out, Falcao round him and somehow hits the bar with an open goal. The ball arcs about 20ft in the air, bounces down a yard outside the goal line, yet then backspins into the net. Never seen that occur in any FM iteration, quite cool in an altogether demoralising way! 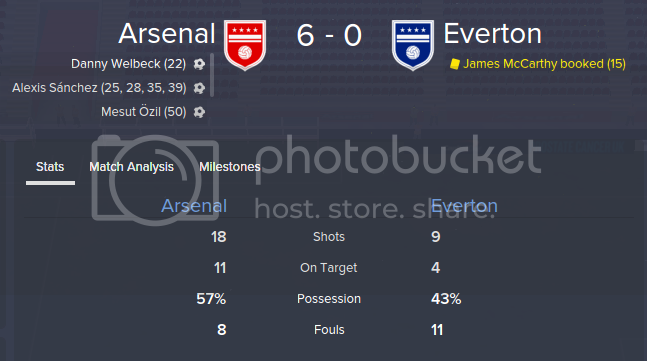 Just started a save with Arsenal. 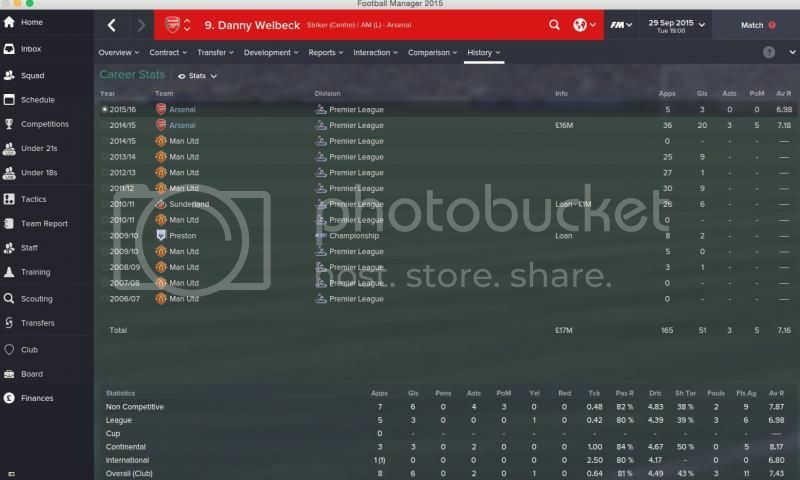 After struggling to get into a save, I actually ran the game through until 9th February 2015 and then decided to take over the Gunners who were sitting 5th in the Premiership upon my arrival, with it looking like Man. City's title to lose so I will be focusing on preparing a squad for next season by assesing everyone in the squad as much as possible before the summer transfer window. 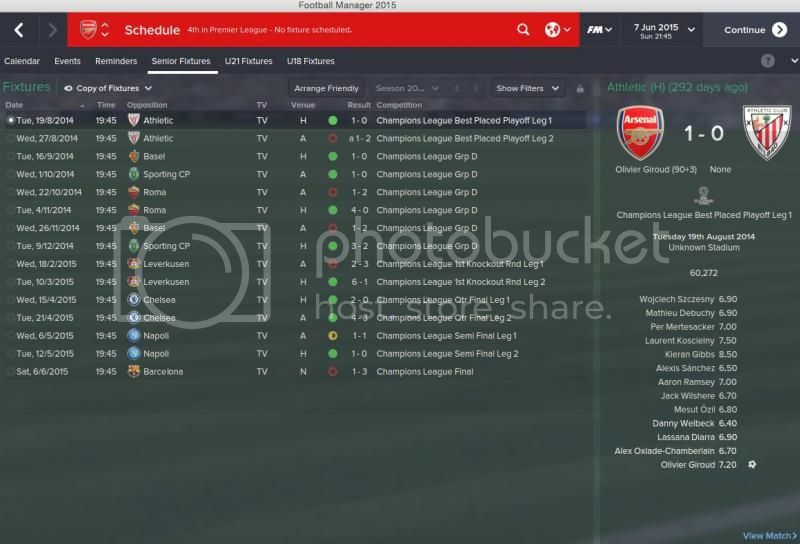 Wenger managed to not qualify for the Champions League Knockout stages after failing to qualify from a group containing Dortmund, Roma and Basel finishing with a miserly 7 points so a Europa League journey will be starting soon where I'll be using mainly fringe players in order to concentrate on finishing as high as possible in the league. These were the transfers made by Wenger as well as the squad stats before my arrival. I look forward to what I hope will be a long and successful reign especially seeing some of the success already in this thread. 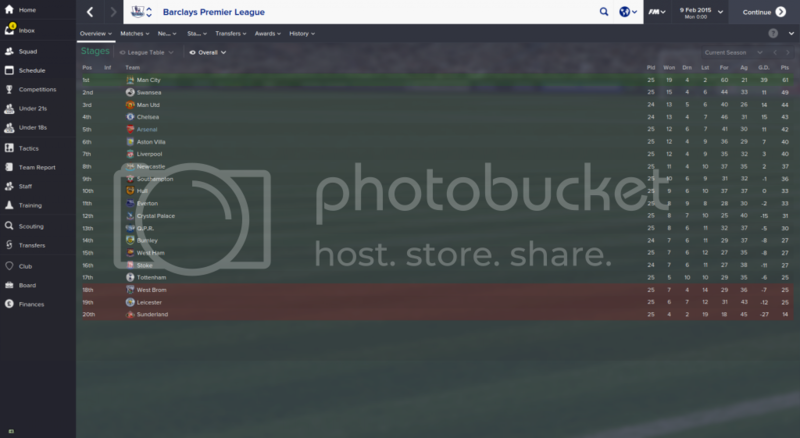 Pretty gutted to have lost my first premier league game in the final game of 2014. Terrible tracking back by Cazorla was the cause of both goals leaving Alaba overloaded. His lack of protection clearly got the better of him because he flew in wildly at the back of Wanyama early in the second half to see a well earned straight red that left a comeback hugely unlikely. My biggest gripe of the season is our lack of clinical finishing. Our conversion rate is no where near what it should be despite the number of goals we have scored. Ozil as roaming playmaker on the MC line is just incredible. He's joint highest key passer on 27 in the league, but sadly our lack of clinical finishing means he doesn't feature in the top 5 assisters. Sanchez is leading goalscorer in the league having played a mix of AML/AMR and occasional DLF(s). Just started a game with Arsenal and i need ball wining midfielder. I am between Wanyama, Sven Bender and William Carvalho. They all cost around 20-22 mln. euros, but i cant decide which one to choose. Any opinions? Wow, never mind you're not so clynical finishing, your defence is immense dude! Oh no, sorry to hear that dude! I've gone for your 4-4-2 home & away tactics for my 2nd season and so far so good (jinx, haha) hammered Ajax 10-1 on aggregate for the Champions League Qualifier. Are you still using the same tactics? What player instructions do you use? Playing my 2nd season at Wembley too as I'm having Emirates expanded to 76,000. I always add that in on the editor - have read a few articles about the possibility of it being expanded in real life so not too unrealistic. Hope you manage to turn your season around. 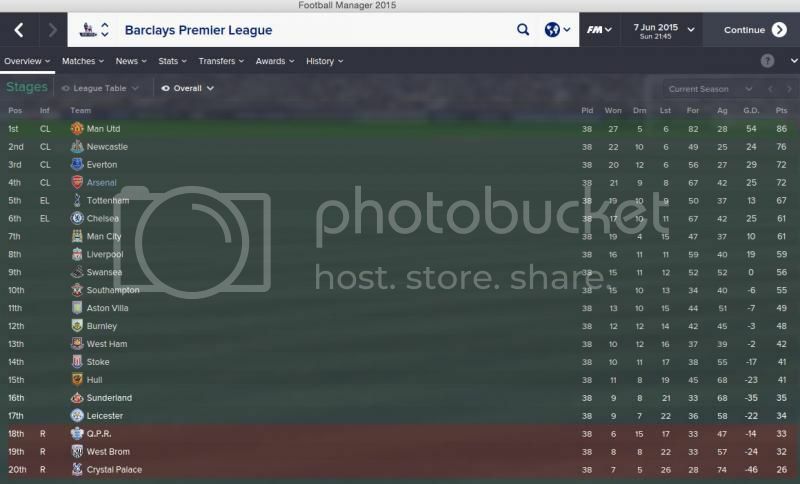 So im coming up to the January transfer window in my 1st season and im sitting top of the table with Chelsea close behind me. Im thinking of looking at bringing in a striker that is alot more clinical that both Welbeck and Giroud as they are both hit and miss. The board have given me 35 mil extra so just thinking who to bring in or who to look at. Any ideas people or who have you brought into the club as a main striker??? I'm having a great time playing Giroud & Welbeck up top together and they're unreal.. as Deep Lying Forward (support) & Advanced Forward. Obviously that doesn't answer your question though, sorry. 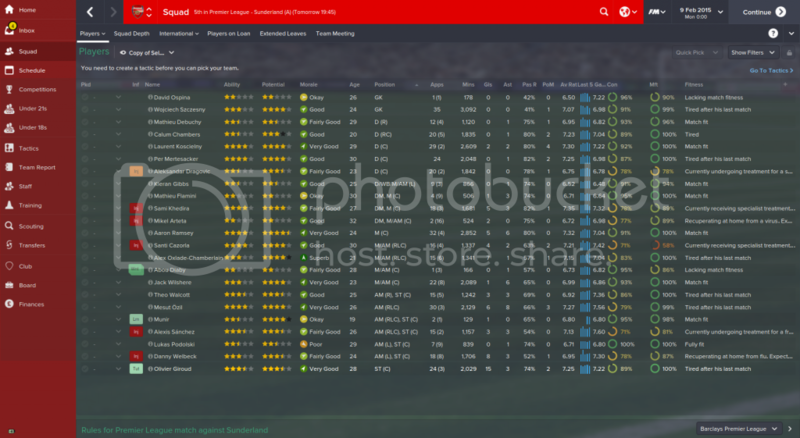 I can definitely recommend Raúl Jiménez a Mexican forward at Atlético, he's been great for me as third choice striker. Cool man, what season are you in? I'm second season in and The Ox has been brilliant so far. Thanks man. The only change I've made to defence was to sign Alaba who actually plays a pretty steady rotation with Gibbs so personnel is much the same. I've also made sure to get my youth involved extensively so I've not played the highest quality back line in many games. The key for me is watching the first 20 minutes of a game in full and making adaptations to any threats that I see early. This adaptive approach to tactics is what I enjoy most so my two trained tactics both define a basic shape and mentality but are otherwise kept really simple. I then use the early tactic changes to adapt how my midfield, wide men and strikers approach the game to best exploit or contain opposition weaknesses and strengths. My next save is going to be with Arsenal, I do support them and have done since I was small even though I don't live in London, I was just wondering though, does the game get boring quickly with them? Or in their experience? I'm really looking forward to getting him into my squad. I don't think I will loan him out once he arrives, unless I can manage to sign an older centre-back, say Sokratis Papastathopoulos or Benedikt Höwedes for fairly reasonable fees. I'm quite excited about pairing Chambers with Gomez at centre-back in the future. Chambers has been mightily impressive in the first-half of his first season here. January transfer window has hit and Giroud has left for £17.5m to Roma. He just wasn't being used. There's something about this save though that really hasn't retained my interest. I don't know whether to start again and try something else or to persevere with the season and shake things up come the 15/16 season. I know what you mean, I had that whole feeling most of the first season.. but now, I definitely have the "one more game" bug in my second season. Perseverance dude! What player instructions do you use? Those are the base instructions. I've started to drop the shoot less often from the two central mids (initially applied on the Beta when long shots were prevalent) as actually Bender has a rocket shot, Ramsey proficient too. I also switch up the two fullbacks quite often. If the opposition aren't playing advanced wingers, both Monreal and Debuchy drop sit narrower, potentially adding stay wider or get further forward depending on opposition formation. With the 442 away sub-tactic I tend to drop the roam from position for the deep lying forward, and then also add close down more, mark tighter, mark specific player (fullbacks) to the two advanced wingers. It has been a rollercoaster season. Since my mid-season wobble the team managed to rediscover form and go on a 12 game unbeaten run, although I've just lost in the CL to Barca after a rip-roaring double-header and been tanked 4-1 at the Etihad. Didn't move up the table much though, due to good rival form all round and a couple of late throwaways. Cracking season though; Chelsea are 8pts clear with a game in hand, but 2pts separates 2nd-5th! 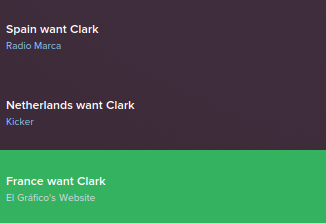 Hate being both a club AND international manager though, makes me lose interest in save.